Every September the city of Edinburgh has a Doors Open Day. This is where places such as the University buildings open their doors to the public for free, putting on special activities and talks for the day. We were lucky enough to be invited to go down to BGS at the Lyell Centre at Herriot Watt University on Saturday 29th September. Our tables were beside those of the Edinburgh Geological Society and geologists from the BGS. 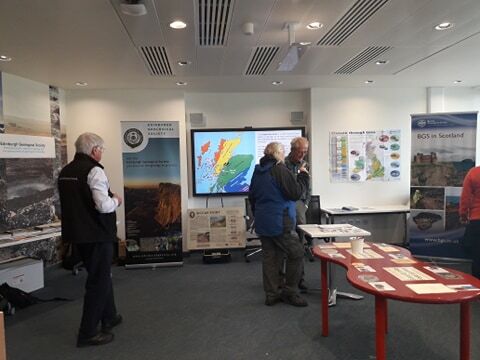 The new fly-through of Lochaber Geopark, made in collaboration with the BGS, was shown on the big screen. 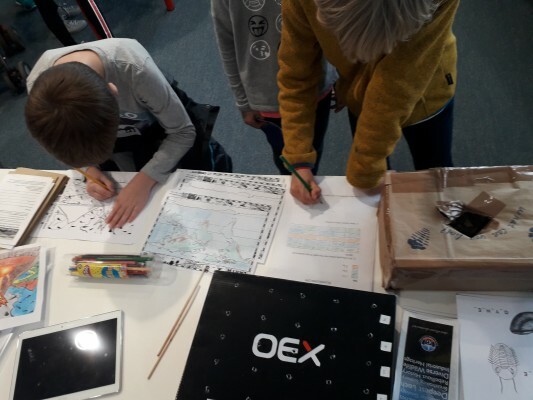 Our interpretation panels and posters were on the wall and children kept entertained by the fossil-find box, geophysical survey and drawings of volcanoes, brought to life using the fantastic app ‘Quiver’. Other highlights of the day were the robotics, where people could interact with new robots and were able to see current BGS research. Thank you to the BGS for allowing us to come along and putting on an excellent event.